Out of the wide variety of intracranial benign cystic lesions, those developing within the arachnoid membrane, apparently because of a splitting or duplication of this membrane,1–10 remain a puzzling phenomenon to the neurosurgeon, even nowadays. 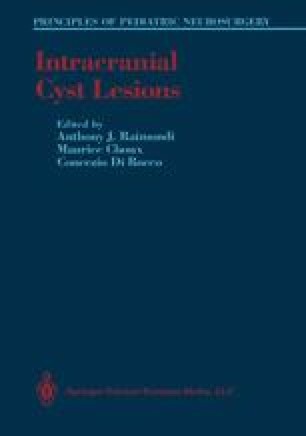 Several aspects of these cysts are still relatively obscure: the physiopathogenesis has not been completely clarified, the natural history is not well known, the surgical indication as well as the choice of surgical modalities are often difficult, and the results of the surgical treatment appear relatively unpredictable in a significant proportion of cases. Though the recognition of arachnoid cysts has been greatly facilitated, even in asymptomatic subjects, by the modern diagnostic tools for neuroimaging, the differential diagnosis with other intracranial fluid collections may still offer some problems.